is an enormous conglomeration of cosmic dust and gasses, located about 500 light years away in the southern Milky Way. Because its colors are so varied and stunning, it is one of the most photographed regions of the night sky. At the core of the large and bright orange cloud at lower left, is the red supergiant star Antares (Enemy of Ares [Mars]). Also designated Alpha Scorpii (Scorpius), Antares forms the focal point of the complex. 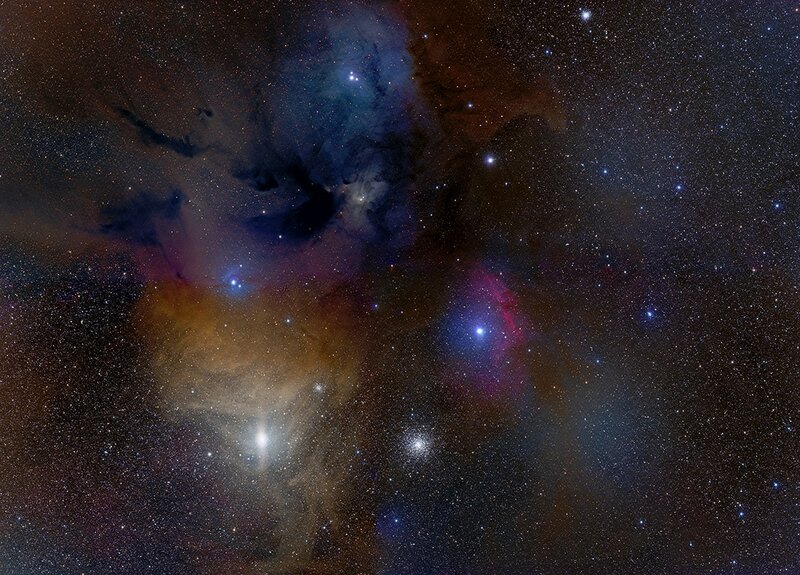 At the center of the large, blue reflection nebula at the top of the field, is the triple star system, designated Rho Ophiuchi, for which the entire complex is named. The beautiful, pink emission nebulosity at lower-right is excited to glow by the bright, blue star Sigma Scorpius. A gorgeous globular ('glob') cluster, consisting of over 100,000 individual stars, lies below and slightly to the left of Sigma Scorpius at 6 o'clock. This is Messier 4 (M4). If you look closely, two other small globs appear in the FOV- one at the very top of the frame, at 1 o'clock, and the other inside the orange cloud, at 10 o'clock with respect to M4. At top-left, are two prominent dark, dust lanes, the uppermost being LDN 1688 from Lynds' Catalog of Dark Nebulae. Immediately below, is LDN 1689. This image is a four-panel LRGB mosaic. I am deeply grateful to Dr. Steve Mazlin for sharing the raw data, imaged with his telescope, and acquired by Jim Misti.